The North County Transit District will eliminate select bus stops in the North County. 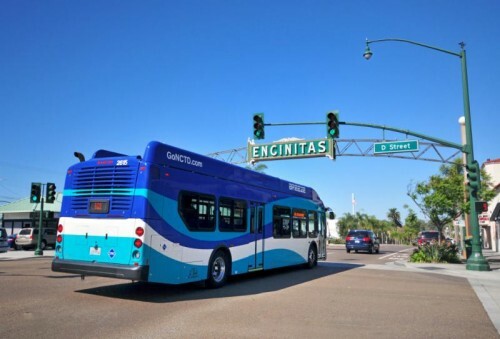 OCEANSIDE–The North County Transit District (NCTD) will move forward with the bus stop optimization plan beginning on April 21. Following the March 6 press release “NCTD Implements Bus Stop Optimization Program”, NCTD decided to extend the original implementation date of April 7 to April 21. By extending the date of the elimination of the identified bus stops, NCTD hopes this will allow ample time for customers to transition and adapt their transit schedule. To increase operational efficiency and support future infrastructure upgrades, NCTD will remove and/or consolidate approximately 90 bus stops throughout North San Diego County, effective on April 21, 2019. These changes are part of a bus stop optimization program which is one of several strategies that NCTD is advancing to increase transit utilization. For the first phase of the program, NCTD reviewed stop spacing, ridership, and information from the Americans with Disabilities Act (ADA) to identify stops with the potential for elimination and/or consolidation. Approximately 90 bus stops were identified for removal or consolidation based on the review. In January, NCTD sent notification letters to North County cities regarding the proposed elimination of the specific bus stops in each city. These letters included a detailed list of stop locations and the average number of daily riders for each stop. In February, additional information was presented to the NCTD Board of Directors regarding these route improvements. NCTD has already issued a notice on its website GoNCTD.com along with information about specific stop removal locations. Signage will be posted at each bus stop proposed for elimination at least 30 days prior to the changes. The notices will provide contact information for NCTD Customer Service who can direct customers to the nearest bus stop.